After trending downwards for much of the summer, EU weaner prices have staged something of a recovery. 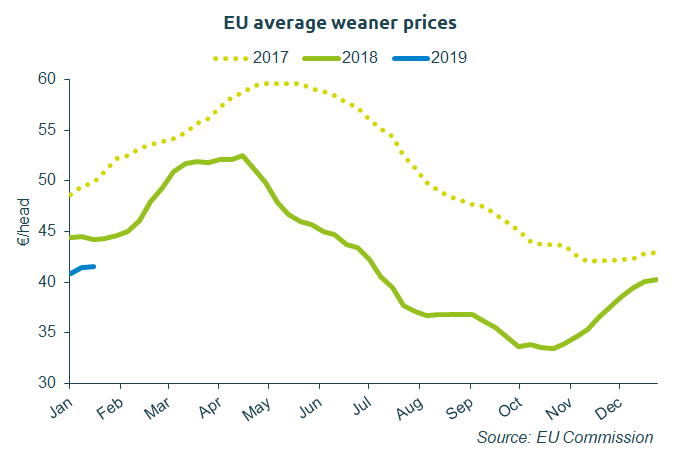 Prices have been rising since late October, and in the week ending January 20, the average EU weaner price was €41.50/head. This is €2.73 below last year’s price, but over €8 higher than the lows seen in the autumn. Duncan Wyatt, AHDB Pork’s lead analyst, said: “Prices in the weaner market typically reflect the trends in the finished pig market, which in Europe, also staged a modest recovery late last year. However, that trend has not continued into 2019. Mr Wyatt added: “However, that being said, the performance of weaner prices has been mixed across different European markets. Over the last three months prices in the Netherlands, an important producer of weaners, have risen by €16.50 to €31.00/head in the week ending January 20. “Spanish weaner prices have risen over the same period too, gaining €17.89 to reach €44.75/head. This may be in response to an anticipated expansion in abattoir capacity, where investment has been underpinned by growing export demand. 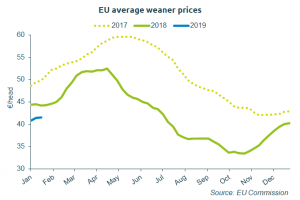 Germany has experienced a more modest price increase in the last three months (+€9.80 to €42.50/head), but elsewhere in Europe weaner prices have been more lacklustre.